2) After all the investigations and images of Sinus Iridum by Change'2 and the pre-released information for Change'3 by Chinese, why did they decide to land at least one (if not two) revolutions earlier - thus landing in Mare Imbrium ? Amazing video stitched from images from the descent camera! Wicked. Thank you for the direct link!! 1) On rover deployment . was the Yutu "pushed" to the ramp before lowering OR did it roll to the ramp before it was lowered. Certainly discern wheels rolling once on ramp but I could not decide whether they were rolling while it moved from top Change'3 platform ? It was commanded to drive. Three separate commands. It's in the video on Emily's blogpost covering this. I'm wondering about the mechanisms they had to prevent the rover from rolling off the transposition mechanism..especially since the rails pitch downward for some time, until the lowering is fully complete. Did the rover energise all 6 wheel driving motors as brakes? (i.e. since the wheels can be driven in forward or reverse, energising the coils to the point just prior to inducing reverse motion) The wheels themselves are mesh..so was there some stop-spike that allows rolling translation (blocked by the brake) but prevents sliding? Or was it all just static friction, and carefully chosen materials? Although the landing area has always (last few years) been described just as Sinus Iridum, it has also always extended into Mare Imbrium. There's a good reason - this is one of the areas on the Moon where basalt flows of two very distinct colors are visible. Clementine multispectral data show it very clearly. 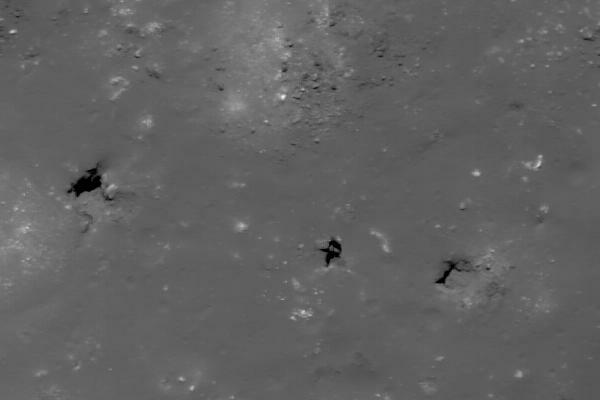 The area imaged at high resolution by Chang'E 2 extends from this landing site on the younger basalt unit deep into Sinius Iridum proper, onto the older basalt unit. There is a boundary between the units only a few km north of Yutu right now, so it will probably drive across it to analyze both units and use radar to probe the boundary between them. But I expect Chang'E 4 to land on the other unit, actually in Sinus Iridum. But I expect Chang'E 4 to land on the other unit, actually in Sinus Iridum. Aren't they really going to land another mission in same place?!??? There are much more interesting place to go to! Landing a sampling rover inside one of these holes would REALLY make China look "better than USA" like they desire so much!! Talking of Chang'e 4, will that be that launched on the same launcher as this one or are they going to put it one of their new launchers? Afterall to do sample recovery I would think they'll need a higher capacity launcher. No, Chang'e-4 is going to be copy HW of CH'e-3 including LV, with mission goals more focussed on science compare to Ch'e-3 which is more technology demonstration mission. Sample return missions will be then Chang'e-4 and Chang'e-5. "Aren't they really going to land another mission in same place?!??? There are much more interesting place to go to!" They have not said this, I am speculating. Why? - because this is the only area Chang'E 2 imaged at high resolution. And they are NOT landing at the same place - it's a different geological unit and might permit a drive up into the hills of Montes Jura as well. I have also speculated that Chang'E 5 and 6 will sample the two basalt units, so both in this region as well. If you want to see the other sites you may have to rely on GLXP. Astrobotic is planning a trip to a pit in Lacus Mortis. Makes sense about tracking availability but surely they would have known this well before mission launched ? Yes, they knew, but they go from being conservative to being more confident, as we do. Thanks AJA. I only viewed that early video that was released very shortly after deployment and with the single frame and intervals between them , I did not initially see any wheel rotation but later videos do seem to indicate early wheel rotation. Like you, interested to know how they judged distance to roll - I assume a sensor to count wheel/hub/axle rotation and therefore know distance travelled ? If the current color balance is correct (and the Chinese flag color looks correct to me) this dark chocolate lunar regolith reminds me of the Apollo 17 site. You can't go by the Chinese flag for colour balance as it is red anyway. Need something white which isn't over exposed. Can't put into words how happy I am to witness a Moon landing and new images from the Moon! Experiencing such an event is no longer confined to reading history books and watching documentaries. We're living it. Thank you China. And hopefully others will follow soon. One thing about that vid: would be great if there was altimeter data to go with it. Like , perhaps, having the small end ramp section being vertical while rover rolls outs towards it . Once rover positioned on top ramp , then that ramp section lowers to meet ground ? Slight extra mechanism overhead . But, I really think their design has merit and maybe could be reused on different missions ? Imagine it will depend upon weight/mass of rover eg. MSL compared Yutu since could become a quite heavy "weighty" mechanism - would a beefed up version have worked for MSL mission ? That footage is incredible. I so wish we'd had something like that for MSL! NASA needs to get it into their heads that the public need to actually see is happening in order to get them interested in what's going on! Regarding the movement of the rover; it's simple, they're likely not just DC motors... they're either brushless, steppers or servos so they have feedback. Any of those can hold their position (torque at 0 rpm) or could have an electromagnetic brake (brake motor). That footage is incredible. I so wish we'd had something like that for MSL! Unfortunately, despite the great imagery from the Chang'e 3 mission, the public is very unaware of what's happening. Poor media coverage and bad timing (Mandela's funeral taking the headlines) are among the reasons. However, I suspect and fear that there is another reason: very few people care about space travel, Moon landings and so on. Incredible Video! Possibly the best Lunar landing footage ever!